Clarets boss Sean Dyche accepts being second in the table counts for little in February. But he is delighted at his side’s form ahead of tonight’s visit of his former club Nottingham Forest to Turf Moor. Burnley climbed into the automatic promotion places for the first time since November with a 2-0 home win against Rotherham United on Saturday. The Clarets have climbed to second on the back of an unbeaten league run of nine games, stretching back to Boxing Day. But Dyche said: “I make it clear, it’s not that I’m not aware of the table, but I don’t stare at it. “We all know when it really counts, and that’s a number of weekends away. “Of course I’m pleased, make no mistake, we’ve earned the right to be there. “We’ve had our bump in the road and are earning the right. “But the main focus is the next game. “People know I mean it, I say it all the time. On Boxing Day, after losing 3-0 at promotion rivals Hull City, Burnley were fifth in the table, with Derby County top. Derby, Middlesbrough and Hull’s form was looking ominous, but such has been the change in fortunes, that Derby are now fifth, five points adrift of the Clarets. Dyche noted: “Over our run we’ve crunched it back up considerably. “There was a time when there was a chance they could break away, three teams to have a bunch of their own at the top, and we pulled it back and are now part of that group. “The main focus from us is about ourselves though, we can’t worry about anyone else, only the opposition you’re going to play next. “Results are results for everyone else, we focus on ours, and we’re on a good run. Dyche is also pleased with how his side is evolving after a summer when they lost Danny Ings, Kieran Trippier and Jason Shackell. His team bear his DNA, and, after a tough 90 minutes against Rotherham, he said: “We’ve said many times, probably 15 games ago, the team was still moulding, still forming – teams always are. “But my main thing is knowing how to win games in different ways, and that was that. 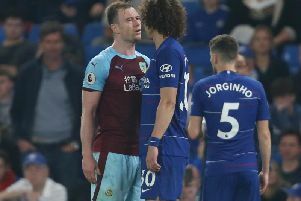 Dyche’s one concern is centre back Michael Keane, who came off feeling dazed after colliding with keeper Lee Camp: “Keano’s ok, he didn’t go out, he just felt a little bit off, and they are more diligent with head injuries these days, rightly so.